What makes a cathedral beautiful? Some people measure beauty by the architecture, size, cleanliness, paintings, relics, sculptures, age, colors, and in many other ways. On our recent trip to Italy, I thought about this a lot. We saw some elaborately decorated cathedrals. We visited the Pantheon, St. Peter’s-in-Chains Cathedral, the Duomo of Florence, the Cathedral of Pisa, St. Peter’s Basilica, the Sistine Chapel, more. Each of those buildings is beautiful for many reasons. Without a doubt, they were built and decorated by talented builders and artists who used their God-given abilities to create magnificent places of worship, and we appreciate their skill, dedication and work. In addition, we are thankful for those who have preserved the buildings for centuries. But the real beauty of the cathedrals is in the One who is worshiped there. If you enter the building and only admire the architects, engineers, painters, sculptors, and others who constructed the cathedral, or if you only take the time to admire the colors, size, shapes, and age of the building, then you have totally missed the point. The God of the universe should be worshiped there. The purpose of the building is to provide a place where people can gather to worship God, and to hear of the good news of Jesus Christ who lived, died and rose again to offer salvation to all who will believe. Of course this can happen anywhere. It can occur inside or outside of buildings. God speaks by the Holy Spirit through the Bible, His Word. You can worship God while you are by yourself or in the midst of millions of people. We are not dependent on buildings to admire Christ. We do not need cathedrals to find salvation. The real beauty of the cathedral lies in the beauty of Christ’s sacrifice and love for us. Nothing can match His radiance and beauty. 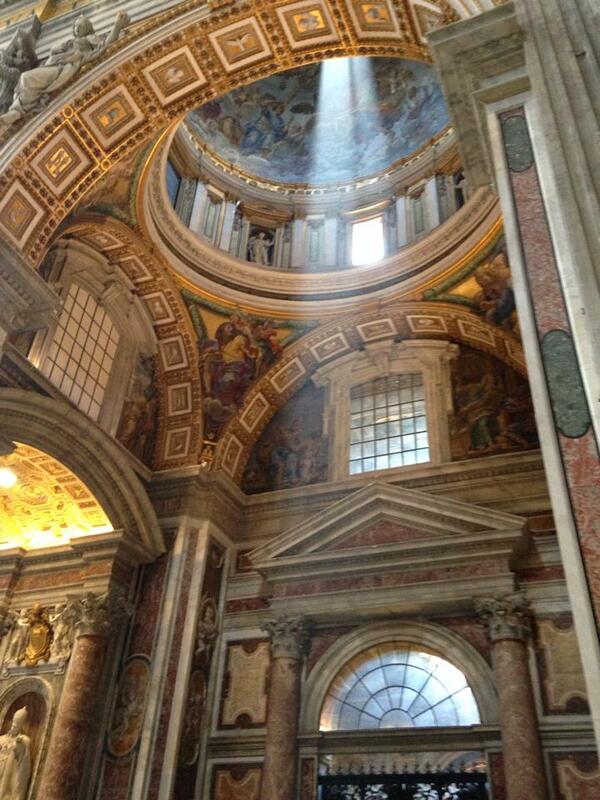 In one of the cathedrals we visited, a radiant sunbeam shone down through the opening in the dome, a great reminder that Jesus is the light of the world.